After declining in the wake of the job-killing 2007-09 recession, workplace deaths and injuries are rising as the economy improves, sparking calls for stricter safety regulations. Fatalities rose 14 percent between 2009 and 2016, with more workers dying from falls, chemical exposure and construction accidents. In addition, violence against medical workers is growing, workplace shootings are increasing and more workers are hooked on opioids to treat job injuries. Moreover, a rise in freelance and contract employment has left many workers unprotected by safety laws. Some industry officials are urging the Occupational Safety and Health Administration (OSHA) to focus less on punishing companies for safety violations and more on helping them comply with safety standards. The Trump administration has responded by halting or delaying action on new safety regulations, even as it increases inspections and enforces existing safety laws. 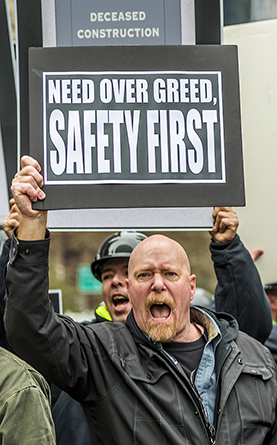 Labor advocates, worried that fatalities and injuries could rise as businesses seek to cut costs, want to preserve existing regulations and enforcement levels.